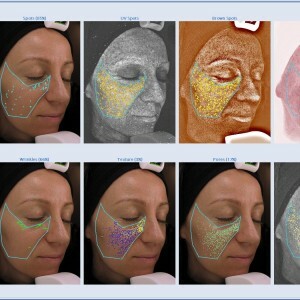 where the skin analyst uses a power Visia imaging technology to capture information and assess common problem areas, such as sun damage, brown pigmentation blemishes, capillary damage, wrinkles, scars or imperfections and congested pores. She will be identifying goals for treatments and offering solutions to overcome niggling complexion concerns and take years off your appearance, without the need to go under the knife. The skin advisor recommends products for use at home, salon treatments as well as dietary and lifestyle advice, which are aimed at giving the individual clearer, more radiant, even toned, smoother and less lined skin. The machine’s camera provides a series of images which reveal the extent of each problem and attributes a ‘score’. Clients pay a return visit to the salon after three months, when improvements are graded by comparing a new set of visuals with the originals.